"I don't know what I was thinking." Miss An'gel frowned at her sister, the younger by about four years. "What business do we have baby-sitting a cat?" "Oh, hush, Sister." Miss Dickce stroked Diesel's head. "He'll think you don't want him here. You know what a well-behaved kitty he is." She giggled. "Not to mention how smart. I'm sure he knows we're talking about him." Diesel warbled loudly as Dickce continued the pleasurable rubbing of his head. "See, told you." Dickce flashed a triumphant smile at her sister. "I grant you he's the smartest thing on four legs I ever did see," An'gel replied. "What on earth will we do if he gets sick or eats the wrong thing? Charlie will never forgive us if anything happens to his cat." "You are in a mood today," Dickce said. "I'll just start calling you Dour Dora and be done with it." An'gel frowned at her sister. "I'm not dour, just thinking responsibly, that's all." Dickce rolled her eyes at her sister. "They're only going to be gone about three weeks. Don't start imagining disasters." She encouraged Diesel to stretch out across her lap. He was so large, however, only about half of him could cover her. "We have a quiet month ahead of us, and we can relax and enjoy ourselves." "True," An'gel said. August was a quiet month for charity and committee work. The doorbell rang. An'gel frowned. "Who on earth could that be?" That turns out to be Rosabelle Sultan, their old sorority sister. True to form, Rosabelle brings trouble in her wake, and soon the Ducote sisters find themselves in the midst of a murder investigation. 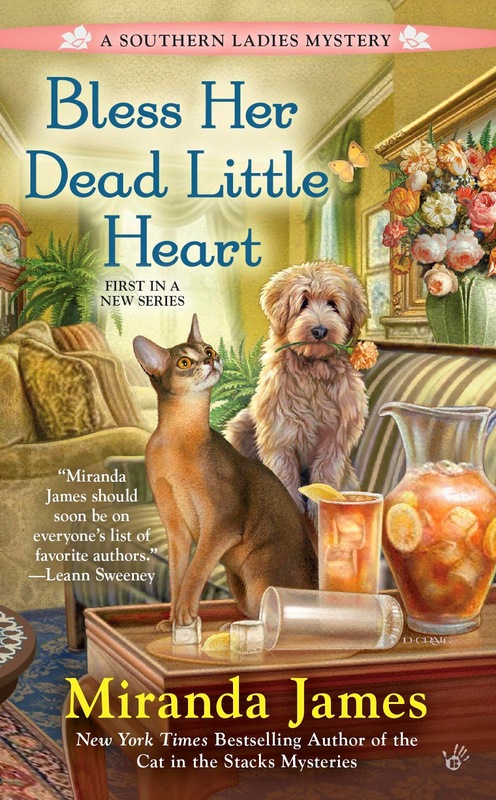 Find out what happens on October 7th, when Bless Her Dead Little Heart goes on sale! This is why I never answer the doorbell. Good luck, sisters! I'm so excited about this new series. Sounds just wonderful. Dickce? LOL! Yes, doorbells can lead to danger! I am so excited for this series. The Cat in the Stacks is one of my all-time favorite cozy series, so it will be really fun to see Diesel in a companion series. Thanks, Renee. I hope you'll enjoy it!